Six Tappan Zee High School students, along with Social Studies Team Leader Scott Silver and teacher Martin Patmos, attended the 7th Annual John T. and Mary A. Grant Rockland County High School History Conference at St. Thomas Aquinas College on March 12. 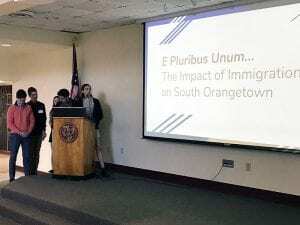 Students from area high schools present original local history research at the day-long event, which is sponsored by the Historical Society of Rockland County. “After attending for the last seven years, I continue to be exposed to surprising revelations and historical details that turn up everywhere around us on a daily basis. I find it is so valuable for the students to be exposed to these accounts and then to become the vehicles through which the history stays alive,” said Mr. Silver. Congratulations to the TZHS conference participants on their presentation: sophomores Parker S. and Julia W., juniors Sophia P. and Jacob G, and seniors Quinn G. and Zoe B.